Welcome, adventurers, to our fireside. A place of stories, novels, mystery and books. A place for heroes, villains, saviours and crooks. but joy in books will always be there. The world can wait, but first: fiction! Want to ask or tell us something? Click here to get in contact with Kyle and Hannah! 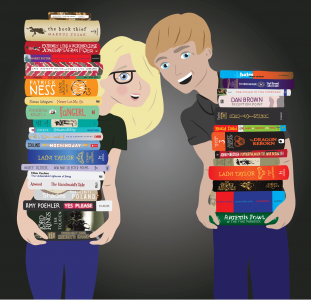 Every Monday we publish a mumble where we chat about all things book and literature related. Click here to come mumble along with us! Every Wednesday we each drop a wordling post, where we chat about ideas, themes, characters, places and story-lines in the books we’re currently reading. Click here to see if you and I love the same things about these books! Every Friday we kick off the weekend with a feature of something we love: a poem, short story, article or post that we have had fun reading that week. Click here to start your weekend with a bang!